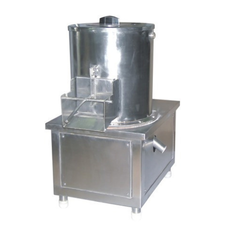 Providing you the best range of potato peeling machine for food industry with effective & timely delivery. Keeping in the mind different needs of our clients, we are offering premium quality Potato Peeling Machine for Food Industry For Food Industry that is used for peeling potatoes in an effective manner. Our offered peeling machine is manufactured using superior quality components and innovative technology in line with industry norms. Furthermore, this peeling machine is available in variegated specifications and sizes as per the requirements of our clients.